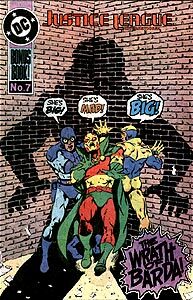 Cover Description: Blue Beetle, Mister Miracle, and Booster Gold cower in the shadow of a giant woman. Brief Synopsis: After Oberon accidentally destroys Mister Miracle's home, Miracle and Big Barda move into a JLI Embassy, disrupting the lives of the other Leaguers. Story Notes: This story was a free insert in Justice League International #18. It was published as a means for DC to test prospective talent, similar to the theme behind the series New Talent Showcase. The events of this issue must take place shortly after events in Justice League International Annual #2, but raise most of the same continuity problems as that issue. Booster commends Mister Miracle and Big Barda on the media blitz that they pulled when their house was destroyed by firecrackers spelling the words "Mister Miracle" in the sky. The event has made the front page of the Daily Post newspaper. Booster suggests that the Justice League contacts Ann Landers for help regarding their domestic situation. Landers was a syndicated advice columnist for over 40 years. Her twin sister wrote the rival advice column "Dear Abby." Booster uses his force field to collect and contain the rubble of the previous house while Martian Manhunter lifts and relocates it in order for the Justice League to build a new house on the same lot. Including foundation, the rubble for a 2-story house such as Miracle and Barda's can weigh up to 300 tons! As each of the Justice Leaguers at work on Barda's house plan their own improvements, Booster thinks to himself, "30th century architecture is far better." How would Booster know? At this point in his career, he's only ever been as far in the future as the 25th century. Boosterrific Review: This "bonus" comic book is no worse than average fill-in issue material. The art is uneven, but not enough to hinder an otherwise passable misadventure featuring gentle caricatures of some familiar Justice League characters. For a free comic story, one could do worse. I thought it was funny. It also was a pretty good ensemble work-letting all of the JLI show their funny sides.